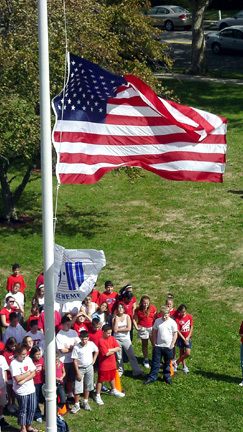 "A Tribute to Heroes," written by Shannon W., along with the sixth grade's poetry selections -- were read. Middle School principle Mr. Bolcar addressed the Middle School students, staff and guests, as well as School Superintendent Mr. Joe Luongo and BOE President Mrs. Joyce Powell. 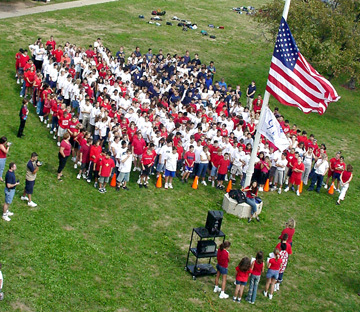 Hasbrouck Heights Middle School took part in a Patriotic Tribute Day on September 11th, 2002. 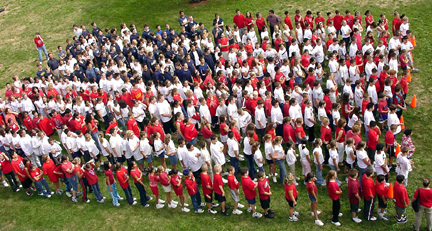 Each grade level wore red, white, or blue shirts to form the "Living Colors of America," a human flag, which was photographed from the roof of the school. Mr. Luongo, Mr. Bolcar, and Mrs. Powell addressed the gathering briefly then the students read a few inspirational poems and an original essay about heroes, unity, and patriotism. Everyone observed a moment of silence to remember those whole lives were changed by the tragic events of Last September. To close the ceremony, Alyson H. led the Middle School in singing the National Anthem. Additional pictures can be viewed in the Middle School hallway along with the quilt and banner that the students made.